Adderstone House has a 10 acre garden within a coastal Northumbrian landscape. There are formal gardens around the house, a walled garden, sunken garden and dry border. Much of the garden is still under development with a long term strategy to compartmentalise it into more intimate manageable garden spaces. Hillside is a young garden, created by Dan over the last nine years, on the sunny lip of a beautiful limestone valley just outside Bath. There are perennial borders but also a kitchen garden and a rich array of wildflowers. The views are quite breathtaking. Whitburgh House includes an extensive collection of contemporary sculpture in the policies surrounding the house. 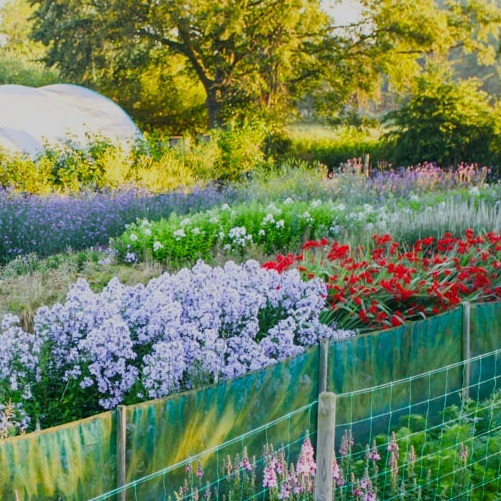 The old walled kitchen garden is the site of striking plantings inspired by owner Elizabeth Salvesen’s travels looking at and learning from gardens around the world.